In a departure from last week’s unrelated films, I decided for this installment to discuss two films that are very different from each other, yet share similarities behind the camera. For those unfamiliar, the Auteur theory of film-making states that a film is the product of the director, that he or she has injected the film with his or her own point of view, fears, personality, etc. For me personally, these are both classics with one of them easily making my top ten favorite movies of all time. Again, because I named the series “Fall and Film,” these are films that I enjoy watching during the autumn season, especially as Halloween approaches. In 1963, Alfred Hitchcock ventured into the monster movie forum with The Birds. The film is well paced, building the tension slowly as only Hitch could do. Our lead character, played excellently by Tippi Hedren, is well rounded, bringing believability, vulnerability, and mischief to the story. Much like Psycho, the real terror manifests when the plot changes after the first act, though it is not as startling in this feature as in Psycho. In this case, it goes from a romantic-drama into full fledge revenge of nature. He has applied his own spin on various genres, including the dark comedy The Trouble with Harry, the action-adventure North by Northwest, and the psychological thriller Vertigo. 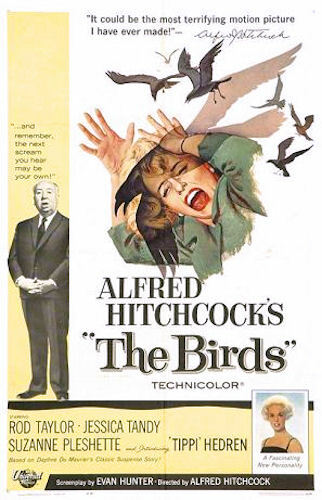 For this film, Hitch takes on the “nature run amuck,” with a group of people fending off attacks by ordinary birds. As I mentioned, the acting and the story are excellent, but certain features of this one stand out to me. WARNING: Spoilers ahead. The strongest feature of this film is the fact that no explanation is provided as to why the birds attack the town. The first half of the film establishes the characters and the plot, then thrusts them in the midst of a terrifying situation. Finishing the uncertainty perfectly is one of the best, ambiguous endings in film history, in my opinion. Our heroes leave, being watch closely by the birds, leaving us the audience unsure as to their fate. Equally as powerful is the fact that the movie does not switch to pure monster invasion in the second half. Rather, the attacks by the birds come like waves on the beach, with unexplainable pauses in-between, causing the tension to rise for both the characters and we the viewers. The Birds is a great watch during the fall season as Halloween approaches. There are plenty of great monster/nature attacks movies, but this has the benefit of having been created by an absolute master. One might wonder why Religious/Drama/Fantasy film would be on my list for the fall viewing schedule. As I mentioned, I love pure horror movies but I also enjoy films that bring about a certain mood and atmosphere. For the fall and Halloween season, few films build a foreboding and brooding atmosphere like The Seventh Seal. A longtime favorite of the art house cinema, Swedish director Ingmar Bergman’s films represent a very self-reflective director. With many of his films possessing a strong religious theme, Bergman constantly calls into question the relationship between humans and God. The Seventh Seal tells the story of a knight who returns from the crusades to find the country side riddled with starvation, despair, and most importantly, the Black Plague. Haunting the knight above all is his existential doubt regarding the existence of God. The film is famous for its visuals, somber tone, and a very famous chess game between our main character and Death himself, which functions as a battle for the Knight’s soul. Dotted with brief light moments from a family of performers, the dark mood permeates throughout the film. 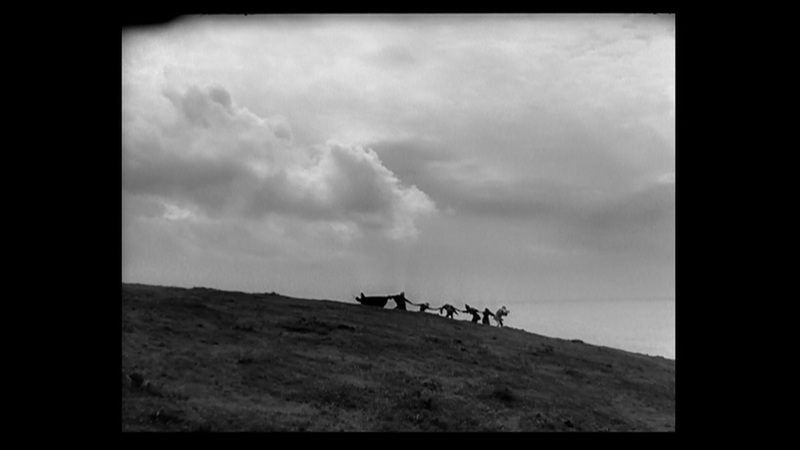 The Seventh Seal is thought provoking, beautifully photographed, and exceptionally well-acted. The notion that even in the best of circumstances death cannot be stopped but merely delayed, is sobering. 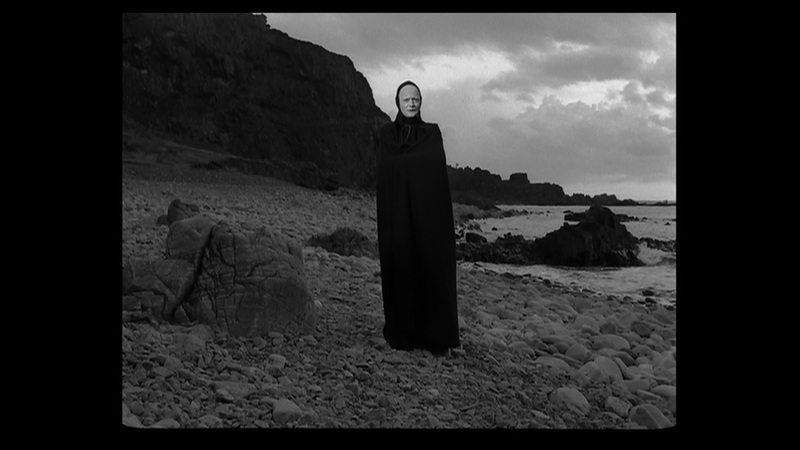 If you have never viewed a Bergman film, or a foreign film for that matter, The Seventh Seal is an excellent place to start. Well, that concludes this week’s selection. I hope you give these classics a watch, as both are fine films. Hitchcock and Bergman were masters of their craft, and the level of care is evident. Thanks for reading. This entry was posted in Movies and tagged Art house, Auteur, Bergman, Cinema, Fall and Film, Hitchcock, Horror Films, Horror Movies, The Birds, The Seventh Seal. Bookmark the permalink. I find the most amazing thing about The Birds is how Hitchcock made such a successful horror-thriller without a stitch of background music to create atmosphere, suspense, or mood. The only time we hear music is when Hedren’s character plays the piano at the house. Excellent point! I wish I had included that.. haha. I always found something unnerving about the bird noises themselves. For me, they are just slightly off from being realistic. I have always debated (and if the answer is out there, let me know), whether this was just the sound samples Hitchcock’s sound person used at the time, or whether it is intentional. It sounds like real birds, but just in a slightly off and eerily fashion.